This article is about the Ghosts created by the Traveler. For The Guardian's Ghost, see Ghost (Little Light). 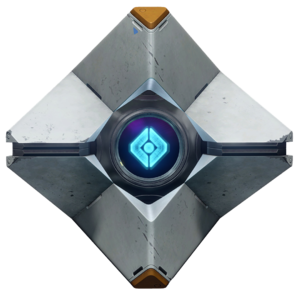 A Ghost is a sapient robotic drone created by the Traveler shortly after the Collapse with the purpose of locating, resurrecting, and supporting an individual capable of wielding the Light. After the Collapse, the wounded Traveler deliberately shed many pieces of itself. These pieces understood intuitively that they had a mission to raise a companion from the dead, their Chosen, and created mechanical shells for themselves. Every Ghost that exists was created in that moment; they are otherwise irreplaceable. Every Ghost has a unique personality and identity, though not necessarily a name. This personality may be intended to complement that of the Chosen they're meant to eventually revive,  and often they have a name coined by their Chosen whilst others may take names they are given by others. Some Ghosts lose hope in ever finding their Chosen; these usually find some other way to make themselves useful, such as joining the Vanguard's covert spectral network, where they act as scouts and spies for the Vanguard. Ghosts that never find their Chosen may be referred to as "unconnected" or "unpartnered". On revival, the Ghost's Chosen becomes a Light-bearing Guardian. Once a Ghost chooses, they can revive no one else. It is possible for a Ghost to bond to someone other than their original Chosen, as with Shin Malphur, though that case required special circumstances. Destiny 2 reveals that Ghosts enter a temporary catatonic state when the Light is cut off from them. Much like their Guardians, the Lightless Ghosts are severely weakened and damaged. Worse, should the Guardians be killed, then they will be unable to resurrect them. Fortunately, at least one Guardian was able to regain their Light from a broken shard of the Traveler in the European Dead Zone. Ghosts are apparently resistant to damage from most weaponry, but can be destroyed by certain weapons or ammunition imbued with paracausal properties, such as Devourer Bullets. An unknown number of Ghosts continue to search for their Guardians; there are recorded instances of Guardians being revived after the conclusion of the Red War. For a Guardian, their Ghost serves as a companion, scout, librarian, and mechanic, waking ancient machinery and cracking ancient codes. Ghosts can support Guardians by performing certain actions such as illuminating darkened areas, repairing technology from the Golden Age, informing Guardians of incoming hostile threats, and providing communications. Most importantly, Ghosts may revive Guardians from death. As long as the Ghost survives, and barring special circumstances, Guardians are effectively immortal and may be resurrected fully intact from any death without consequences. The death does not have to be immediate, nor do they have to be revived in the same place they died. Ghosts may also repair any injury a Guardian suffers in a matter of seconds. Ghosts serve the important function of a narrative device, acting as a vehicle for important tasks such as informing players of new objectives, and also serve as a revive/respawn marker when a player's character dies during cooperative play. Ghosts notify players when another player/Guardian has left the area or is revived. A Ghost can assist to more quickly revive another fallen player by holding the X button on the Xbox 360/One, the square button on the PlayStation 3/4, or the E key on PC. This can only be done in close proximity to a fallen player's death location, marked by his Ghost. On occasion, while on missions, certain objects must be scanned either to progress the narrative provide additional context to the Guardian, which is visually represented as the Ghost flying out and scanning the object of interest. For example, scanning a dead Cabal on Phobos will have Ghost describe what legion it's from. For more information, see Ghost Shells. Ghost shells change the appearance of Ghosts. The Taken King adds defensive boosts and additional effects to ghost shells. Rare shells have a single perk, while legendary shells have several to choose from. Shells can be purchased from The Speaker, the Vanguards, or Lord Shaxx. As of Rise of Iron, Ghost shells marked with New Monarchy, Dead Orbit, or Future War Cult colors and symbols can be bought from faction representives. Ghosts without listed Guardians are not known to have one, either stated outright or simply never mentioned. Agu - The Ghost of Nkechi-32. Bahaghari - The Ghost of Aunor Mahal. Balthazar - An unpartnered Ghost. Cassiopeia - An unpartnered Ghost. Didi - The Ghost of Marcus Ren. "Ghost" - The unnamed Ghost of The Guardian. "Ghost" - The unnamed Ghost of Tyra Karn. "Ghost" - The unnamed Ghost of Enoch Bast. "Ghost" - The unnamed Ghost of The Drifter. Gol - The Ghost of Orin. Jinju - The Ghost of Anastasia Bray. Link - An unpartnered Ghost. Neville - The Ghost of Fenchurch Everis. Ophiuchus - The Ghost of Ikora Rey. Panza - Ghost of an unknown, "unreturned" Guardian. Peach - An unpartnered Ghost. Pixie - The Ghost of Ariadne Gris. Pom - The Ghost of Marin Mansanas. Pulled Pork - The Ghost of Uldren Sov. Pup - An unpartnered Ghost, last mentioned to be in the care of Micah-10. Sagira - The Ghost of Osiris. Sundance - The Ghost of Cayde-6. Strain - The Ghost of Cyrell. Yourghost - The Ghost of Savin. "This is some great data here. I wonder if Ikora gives hugs to Ghosts. Heheh... anyways, nice work." "Don't do that. "—says this after the Guardian jokingly copies what the Exo Stranger had said in an encounter that just happened. "You know it's starting to concern me how seldom you talk. We've been through a lot together, the neural symbiosis is pretty far progressed, but you'd be surprised how little I understand what you're thinking." Ghosts were sometimes called "Dinklebots" by players, as a nod to Peter Dinklage, who provided their voice in the game. As of The Taken King, Nolan North replaced Dinklage as Ghost's voice actor and redubbed lines from the original Destiny game. Players have started to call this new Ghost "Nolandroid", though Nolan North himself prefers "Nolanbot". It was indicated pre-release that players need certain equipment before having access to a Ghost. This is currently not the case, as the Ghost is present with the player from the start of the game in current builds (having revived them). Holding out a Ghost in some sections of the Moon opens doors. However, they are pitch black inside. Ghosts may be deactivated and revived. The Ghost's saying "We always visit such cheerful places" is a possible reference to Cortana's line in Halo 2 on the level Delta Halo, saying: "We always visit such nice places". Dead Ghosts can be found in the game world which, upon revival, unlock new Grimoire cards. According to an advertisement for Destiny, Ghosts existed during the Golden Age. This is likely an error as all other sources have stated that Ghosts were created by the Traveler after the Golden Age. The Ghost was depicted as taking part in the Ice Bucket Challenge in a short video by Bungie, which donated to the campaign. Concept art of the Ghost. More concept art of the Ghost. In-game view of the Ghost Frontier Shell available from the Destiny Ghost Edition and the Destiny Limited Edition. Extracted view of the Frontier Ghost Shell. One of the Ghost Shells that debuted in The Taken King. The Ghost replica that is included with the Destiny Ghost Edition. Concept art of a Warlock with a Ghost. A close up to the Ghost. A Ghost with a Warlock. Guardians being led by a Ghost. A ghost lighting up an area. Player reviving a defeated Guardian, whose last position is marked by their Ghost. A Ghost floating in a Guardian's hand. A Ghost scanning a Fallen device. ↑ Planet Destiny: Vault Space Increased, Infusion, & Swords! ↑ Youtube: "I wonder if Ikora hugs Ghosts"
↑ YouTube - Cayde's Stash: New Dialogue? ↑ YouTube - Eurogamer: We ask Destiny's Nolan North: Is it Northbot or Nolandroid?